Staff with years of industry experience deliver our Inspection and Testing Award. Through a mixture of theoretical and practical work, students will learn everything they need to know in order to gain their qualifications. As many people looking into this qualification will be already in full-time work with limited spare time, we have split the training into two parts. Our Inspection and Testing award is aimed at existing electricians who wish to gain a recognisable qualification for the inspection and testing aspect of electrical work. This award demonstrates competency in the ability to inspect, test, report and certify both new (initial) and existing (periodic) electrical installations. We provide our students with the support they need and the best platform possible from which to gain their inspection and testing award. 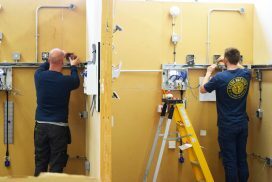 At Options Skills, we also offer several electrical training courses, including: NVQ Level 3 Electrical Training, Domestic Installer Award and Accelerated Electrical Training. This award is sometimes referred to as '2391', which is the name given to the City & Guilds equivalent of this qualification. Both awards are recognised in the electrical industry and are assessed in the same way. Candidates undertaking the course must hold the 18th Edition Wiring Regulations as a minimum. It would be beneficial for the applicant to have at least 2-years’ experience and hold a Level 3 Electrotechnical NVQ Diploma. Some practical and theoretical knowledge of inspection & testing would also be advantageous. The EAL Level 3 Award in Electrical Installation Inspection, Testing, Certification and Reporting usually form part of a suite of qualifications that an electrician will hold. E.g, an electrician that holds the JIB Gold Card as an Installation Electrician can use the inspection and testing qualification to gain JIB Approved Electrician status. Approved electricians are often viewed at supervisors’ level with larger electrical contractors. It also helps the holder of the qualification demonstrate and prove competence in this field. It is true, that you do not need to hold a specific Inspection and Testing Award in order to inspect, test, report and certify on new and existing electrical installations. Guidelines state that the person that completes the report must be deemed to be ‘competent’. Competence is usually determined by qualification and experience. The programme incorporates Testing and Inspection on single phase and three phase electrical installations. The qualification, aimed at electricians with experience, is designed to test understanding of Electrical Inspection and Testing. You will receive log-in details for our pre-attendance on-line study programme. This is important as the inspection and testing qualification is very challenging. We believe it is important that all attendees on the course are prepared fully for the final assessment in part two. Your progress will be monitored, and you will be expected to complete the online course before progressing to the next stage. It is expected that this part of your course will require a minimum of 20 hours of home study. You will also take an online test, you will be expected to achieve a minimum score of 70% in this test before progressing to centre led instruction and assessment. Days 1 & 2 – Tutor led theory refresher training. You will receive log in details for an online study programme that you must complete before you complete the second stage of your training. This is an online course and is designed to ensure that you are prepared fully for the course and your official assessments. It is anticipated that you will spend 20-hours working through the pre-course material. You will also take an online test. You must score 70% or above on this test before you can proceed to the second stage. There is no limit to the number of times you attempt this test. Subject matter covered as part of the pre-course material as follows. Day 3 Inspection & Testing Practical training. One of the electrical tutor team will demonstrate the order and procedures of testing. The candidates will then have the opportunity to practice themselves on our single and 3 phase test rigs. In the afternoon candidates will undertake their first practical assessment, to identify electrical defects on a test rig. The time allowed for this assessment is 1 hour. Day 4 Candidates will undertake an online mock exam during the morning session. There will be an opportunity for some intensive revision before the real online exam is taken in the afternoon. The online examinations have 60 questions and candidates have 120 minutes to complete the test. Day 5 Candidates will undertake their second practical assessment. This is a full test of a 3 phase and single-phase test rig with some faults introduced on various circuits. The time allowed for this assessment is 2.5 hours. Candidates will have allocated times during the day to come in for this assessment. Why Train As An Electrician? What Happens If I Fail? Will I Get A Refund If I Fail? Am I Guaranteed To Pass The Exam? Will I Be Taught How To Pass The Exam? The UK electrical contractors market is reputedly worth around £18.2bn a year (source: AMA Research). However, it is highly fragmented and comprises mostly of independent contractors and sole traders. The industry is characterised by poor service and unreliability. Consumers are wary of who they appoint and often find it difficult to find trustworthy tradespeople. When they do, they use them again and again and recommend them to other people. The size and maturity of the sector combined with the failure of the general competition to meet customer expectations represent a real opportunity to profit from a professional and customer-focused local service. 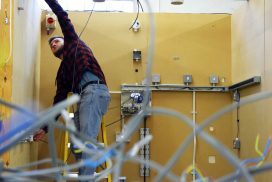 For more information, read How Much Can I Earn As An Electrician? Options Skills offer a great service, providing you with the best opportunity to add to your skill set and we will continue to offer ongoing support even after you’ve finished training. Throughout the course, you'll have a dedicated student liaison manager ensuring everything is going smoothly, from your centre-led training to the on-site work experience. By enrolling into our Inspection and Testing course, Options Skills provide you with the opportunity to earn your Level 3 award. 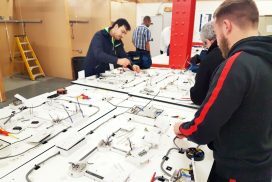 Upon completion of both stages of the training course, you will be awarded your Inspection and Testing award, This can be used to gain JIB approved electrician status. If you fail any of your exams, we do offer students the opportunity to resit them. Options Skills will provide students with extra training or support if necessary, free of charge to help prepare you for your re-examination. Unfortunately, we cannot provide those who fail their exams with a refund. We do, however, offer the chance for students to retake their exams and we can provide extra training and support necessary. Options Skills are in no way able to guarantee any student will pass the exam. However, we do provide our students with expert training and that, combined with their hard work and dedication will give you the best opportunity to pass the exam. While we will provide students with excellent training - both practical and theoretical – we will not teach you how to pass the exam. Passing any exams or assignments is dependent on your level of knowledge, dedication and hard work. Skype & email support available. can train with Options Skills. before you make a decision. people to see our facilities. to continue to add to skills.